Judy, at work, wasn't she cute? And young!!! This recipe is from Ada Ruth Kellerman. Mom was given this recipe to bring to a Mother Daughter banquet at her church, Evangelical Free, in Tempe, Arizona, May, 1974. All the women bringing the main dish used the same recipe. It was interesting to see how different each casserole looked. Needless to say, Ada Ruth's, Mom, looked the most appetizing and tasted great. 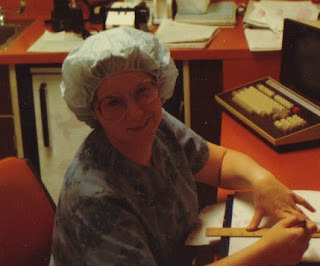 I was an operating room nurse at Dessert Samaritan Hospital, about 1/2 mile as the crow flies from Mom and Dad's house. On more than one occasion I would call Mom in the middle of the morning and ask if she could bring me the casserole. She always said yes. One time my uncle had to take her to the store to get a chicken to stew so she could make the casserole. Talk about fresh!!! All the nurses, and a few lucky doctors, loved this casserole. I have given this recipe to many friends over the years, it quickly became a favorite to all of them, the fact that it is easy to make is a real plus. Now I often get a rotesserie chicken in the deli to make the recipe even easier. employee pot lucks. Easy and delicious. I need to post this recipe on the fridge for my family to make when I'm at work. This one was a big HIT! Kudos to Grandma and Judy! Way to Go!! Touchdown! Whoo Hoo!! Boom Chicka Boom! !